The main library at Cork Institute of Technology moved to its new facility in 1994. Currently it is one of the most modern and technologically enriched academic libraries in the country. In a total area of 2,600 square metres, the library provides more than 600 study spaces, more than 70,000 volumes along with subscriptions to a comprehensive collection of journal titles. These cover all subject areas taught in the college including Science, Engineering, Business, Social studies and Humanities. There are specialist Art and Music collections in the libraries at the Crawford College of Art and Design and the Cork School of Music respectively, both of which are under the auspices of the Cork Institute of Technology. The CIT Library aims to enhance the quality of academic experience available at CIT by providing excellent physical facilities, and by delivering information resources in all formats, in the disciplines and at the levels appropriate to the Institute’s faculty and students. Through building and maintaining collections, and providing access to information sources held elsewhere, the library will support the learning, research, and creative activities of the Institute, and help address the information needs of the region in its economic, industrial, social and cultural development. To promote opportunities for lifelong learning by enabling students to develop the skills needed for creative and critical thinking, and problem-solving, in their chosen careers and in their lives generally. To ensure access to information resources worldwide, both electronic and print, through enhanced connectivity. Through the combination of on site resources and access to resources held elsewhere, to support the full range of CIT programmes and educational activities. To Liaise effectively with students and academic staff. Seek to establish active partnerships with academic departments and programmes in the development of new initiatives. Ensure that all academic staff and students are aware of the library’s resources, and that they are able to exploit them efficiently. Databases are an extremely valuable information source in any modern academic library. 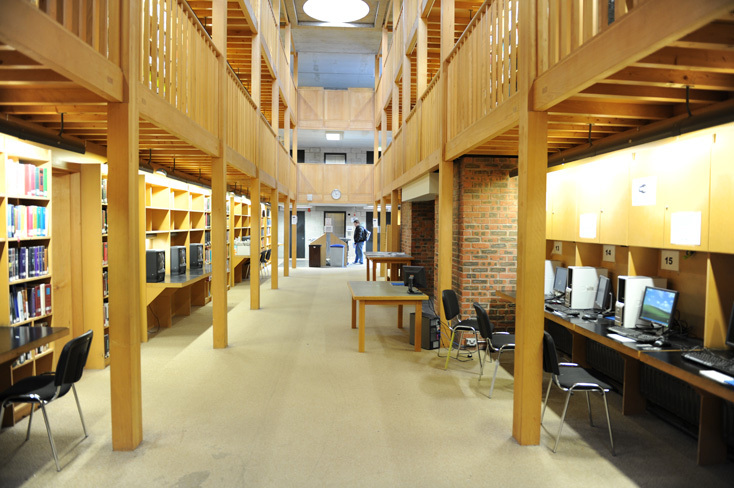 The CIT Library subscribes to a number of prestigious academic databases. By virtue of the very fact that these electronic resources are so broad ranging, they are highly complementary to the Library's book-stock. A full list of our databases can be accessed from the CIT Library homepage under the E-Resources search tab. As well as having access to thousands of online journals via our database subscriptions, the Library also has an extensive back catalogue of journals and periodicals. These cover all subject areas being taught within the Institute. These are shelved on the first and second floor balconies, and can only be consulted within the Library. More recent hardcopy journals are located on the long curved first floor balconies. At certain points throughout the academic year students studying different courses may be expected to consult Official Publications (OP) and European Union (EU) material. The Institute's library has a comprehensive collection of such publications. Official Publication (OP) material include Irish Government Reports, Dail Debates, Semi-State Annual Reports along with material from groups such as Failte Ireland, EPA and Forbairt, etc. Such material is for reference only. The Careers Section is located on the first floor of the library, outside the library conference room. It contains useful information on prospectuses from other colleges as well as books on how to prepare CVs and apply for jobs. Printing facilities can be found in the Open-Access section of the adjoining IT building. However photocopying facilities are also available within the library. Photocopiers are located in the Reference area on the ground floor. Students can print to any photocopier from any computer in the college. The library has its own suite of personal computers. All of these can be used to search the library online catalogue and can also be used for online research. A group of 3 or more students up to a maximum of 8 students can reserve a quiet group study room during library opening hours. CIT Library Study Hubs are available to all students currently registered at CIT. CIT staff can also reserve a private room for seminars or conferences. This conference room is equipped with a variety of presentation aids and also has network connectivity. * Please note that if you require the use of a projector, you will have to contact Mr.Barry O'Sullivan in the Audio Visual department (ext. 6298). The Irish Times, The Examiner, The Irish Independent, The Guardian and the Daily Telegraph are regularly available to Library patrons. These newspapers are stored on a rack in the main reference section. Wi-Fi connectivity is also available within the CIT Library. To find out how to connect your mobile device to the library Wi-Fi network, please visit the link below. Past Examination Papers can be accessed in electronic document form, but only within the CIT network. Click here for past exam papers. The Library Information Desk is currently open Monday to Thursday - 12.00pm to 2.00pm. Please come along to talk to a Library Staff member if you need help using any of the Library Resources. Staff will be only to happy to assist you in any way that they can. When the Information Desk is closed, please go to the main issue desk. Alternatively you can e-mail us at library.info@cit.ie with any questions. Queries sent to this e-mail address are usually answered within 24 hours, Monday to Friday.